website @ www.rmc.gov.in before last date. There are total 75 Clerk vacancies available in this RMC recruitment 2017. Online application link activates from 11/05/2017 (10.30 AM) till 30/05/2017. RMC recruitment selection process will be based on candidate performance in competitive examination and skill in Typing test. Deposit the application form fee before 31/05/2017 through ICICI bank Challan at any ICICI branch. 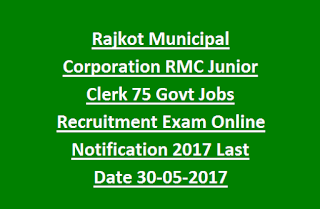 Other details regarding Rajkot Municipal Corporation general recruitment 2017- Age limits, Salary, Educational Qualifications, Selection process, Examination syllabus & Pattern are given below. 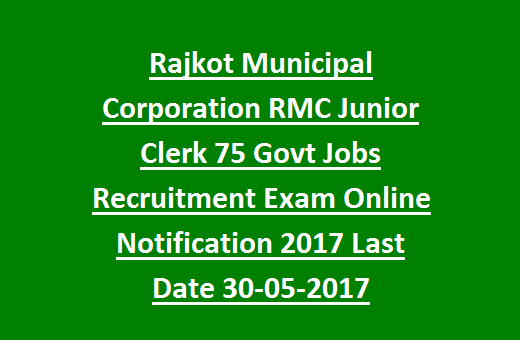 Click here to see the official notice of Rajkot RMC Junir Clerk Jobs Recruitment. Starting date to submit application form: 11-05-2017. Last date to receive filled application: 30-05-2017. Closing date for the payment of application fee: 31-05-2017. Vacancies available in Rajkot Municipal Corporation are 75 posts. Post Name: Junior Clerk: 75 posts. Applicant should have the basic computer knowledge. Candidate should have completed 10th and 12th examination or degree or certificate course with computer knowledge from any recognized institution. Minimum age limit of the candidate should be 18 years and maximum age limit is 30 years. Age relaxation will be applicable as per Govt rules. Competitive Examination Question paper consists of 100 questions for 100 marks. The time duration is 60 minutes. Application fee for general candidates is Rs.100/- and for SC/ ST/ OBC candidates is Rs. 50/- through any ICICI Branch. Interested candidates may go through the RMC official website of @ www.rmc.gov.in to apply online for RMC recruitment 2017. Fill the application form carefully and upload with valid ID proof/ Photo, other documents before last date. Closing date to send application form is 30/05/2017. Applyonline for the RMC Jr. Clerk Jobs Recruitment 2017.